An interesting movie that is just a little too drawn out with its world of characters and multitude of storylines. Lone Star is a cool movie that takes us down the paths of three different families and how in their current lives they are tracing over they’re past roots. There are mysteries at hand about what happened in the past, and who was murdered, and who did the murdering, and it takes an investigation into a number of characters to solve the mystery. That’s because the murder took place over twenty years ago, and featured a whole different set of characters. We basically get flashbacks into two or three different storylines. There’s a lot on the table here, but it all makes sense and is easier to follow than one might expect, simply because all the stories are interwoven with each other and connect into one. Characters constantly appear in each other’s stories and we understand that everything is being driven by an attempt to solve the mystery. There are definitely too many characters and storylines here, and more should have been trimmed off this movie, but if you can get past that and focus on the three main plotlines, this is a very clever and intriguing film. Lone Star is a good movie. From an artistic point of view, it’s pretty fantastic. There are lots of stories here and lots of characters and they all exist in the same Texas town, crossing paths, and popping up in each other’s stories. Lots of movies do that exact same thing, only Lone Star feels different for a number of reasons. For one, it doesn’t do it to be gimmicky. It’s not trying to be cute. Characters appear in other stories because they are actually part of the other stories, and not because they just happen to be there, in the background. Another reason why this movie feels different is because all of the connections are woven into the film, instead of only appearing at the end, or in the second half. Instead, the entire movie has characters crossing paths. 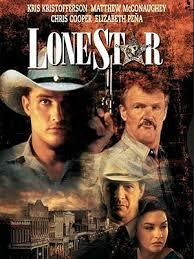 Mainly, though, Lone Star works because it has two different mysteries at heart. The first mystery gets started right at the beginning of the film. The very first scene has two men about searching the prairie for lost jewelry and valuable items and finding a buried skull. 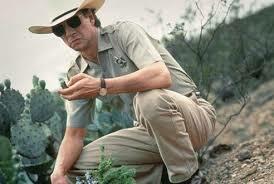 They call the local sheriff, Sam (Chris cooper), who comes over and talks to them about what they found. And while he’s out there investigating, the boys turn up something else… an old sheriffs badge. Could this be the body of the old sheriff, Charlie Wade, (Kris Kristofferson), who disappeared one day and was never heard from again? Before we get into the suspicions of that mystery and learn about who wade was, we meet some other characters. There’s Elizabeth Pena, playing Pilar, a schoolteacher who teaches high school history and is criticized by parents for the content she teaches. There is a debate here about the perspective she uses to teach, and how she is teaching the Mexican point of view of what happened and not the American point of view. The problem is, most of Texas is Hispanic. Sam is actually dealing with the same thing with being sheriff, hearing that he will be the last white sheriff in Texas, and even meeting the Hispanic man is being asked to run in the next election. Another story that we start to follow early on, involves a black family who just moved to Texas. There’s the father, Del, (Joe Morton), who is a tough as nails military colonel, and his wife and son. The son is Chet, a high school student, curious about his family, who happens to be in Pilar’s history class. That’s one of the weaker connections in the movie. The stronger ones are on the way, once the plot starts to get going. Del’s father, Otis (called O) lives in this town and runs a local bar, only o never had anything to do with del growing up and never even asked about his son. Del now wants nothing to do with his father, despite moving to the same town. And Chet is interested in meeting his grandfather. This story of the black family is the third story of the film, and definitely the weakest. But it does play nicely into some of the other stories. Lone Star is about the mystery of who that skeleton belonged to and also who put the body there, but it’s also about lots and lots of other things. There is another mystery on hand here too, about how certain characters are connected, only we don’t learn of that one until the end of the film, and don’t really know it’s a mystery until it is revealed. That becomes the end twist of the movie. In the meantime, in order to find out who happened to sheriff wade, we have to go back and time and see each of the three families when they were younger. For the black family, that means watching a young O, working at the bar. For Sam’s family, it means tracing over his father’s past. His father was buddy Deeds (Mathew McConaghey), the young and energetic sheriff of the town. Buddy replaced wade and had a big problem with wade’s violence and corruption. Charlie Wade wasn’t just a thief, he was also a killer. We get many scenes that show us just that, with him shooting men who don’t suspect it at all, and just walking away as if it was nothing. He’s the guy who thinks he can do whatever he wants and not have to answer for any of it. The other family is that of Pilar. She has a son now who is arrested and who Sam has to help out of prison, (the first connection between these two storylines), but the real important story here is that of her mother, Mercedes Cruz. Pilar’s father was Eladio Cruz, a man who used to bring over Mexicans, across the border, sneaking them in by hiding them in the back of his truck. One day Charlie wade caught up to Eladio, and the rest was history. As the movie goes on, we follow Mercedes, as a no-nonsense restaurant owner who insists her employees speak English and calls the border control when she sees Mexicans sneaking in. all of these things makes it so that we are really thrown for a curveball when we learn about her past. The black family factors into the story only because young o was beaten and harassed by Charlie wade at his own bar, and also because there is a good chance that o saw or knows about what happened to wade. So do some of the other older members of the town, who are keeping quiet about the truth. They want to see buddy deeds treated as a legend and see a plaque get cemented and hung up in the middle of the town, in honor of their great sheriff. It is Sam, buddy’s son, who has more of a problem, or a question, about this than anyone. That’s because Sam has the suspicion that maybe buddy was a killer too, and was the guy who killed Charlie wade. Sam wants to get to the bottom of that mystery before the plaque is raised in buddy’s honor. Despite being very lengthy and drawn out, Lone Star does have a certain feel of urgency. Unfortunately, it only creeps in during the second half. The first half of the film is too busy with side plots and characters that don’t really matter. This movie does have a little too much going on. As it is, there are three stories of three families here. Then there’s seeing the story of each family in the past, with lots of different characters (the Charlie Wade, buddy deeds, and Eladio Cruz characters are all in the past stories only.) that makes for six different stories. And then on top of all that, the movie is carefree about bringing in the stories of other characters, such as an interracial couple, where both the man and woman have jobs at an army training camp, or the story of a young female cadet who gets mixed up with violence and drugs and is trying to stay on the right path. We even get to meet Sam’s ex-wife, a football nut played by Frances McDermond. The problem is that it seems like director John Sayles just wasn’t willing to cut anything at all. Now I love movies with multiple storylines and lots going on, like Copland, but Lone Star definitely push the border of what is acceptable. If some of those side characters and side storylines were cut, this would have been a much tighter film. But Sayles really wanted to present the picture of the whole town, and lots and lots of different lives going on there at the same time. He certainly did what he set out to do, and despite some extra fat on the sides, there are still some great stories at the center of this thing. Mainly the Sam tracing father’s story and the Mercedes Cruz-Eladio Cruz story. It definitely helps push this movie along knowing that it is all in the pursuit of a mystery and that there are answers coming at the end. Lone Star is a very smart and enjoyable film that just takes a little patience to get past some of the excess material.